As I mentioned previously, two of my best friends are born on the same day so it was really a headache for my other friend and I to decide on a place to eat that won’t make such a dent in our wallets but still serve awesome food. Thank goodness I have another well informed friend who keeps tabs on places which offer good food at great value. She recommended ricciotti at china square central because of their 1 for 1 pizza deal during our previous CCA gathering and after that, I knew this would be the perfect place for the birthday celebration! Pardon me but I can’t remember all the Italian names for the pizzas. 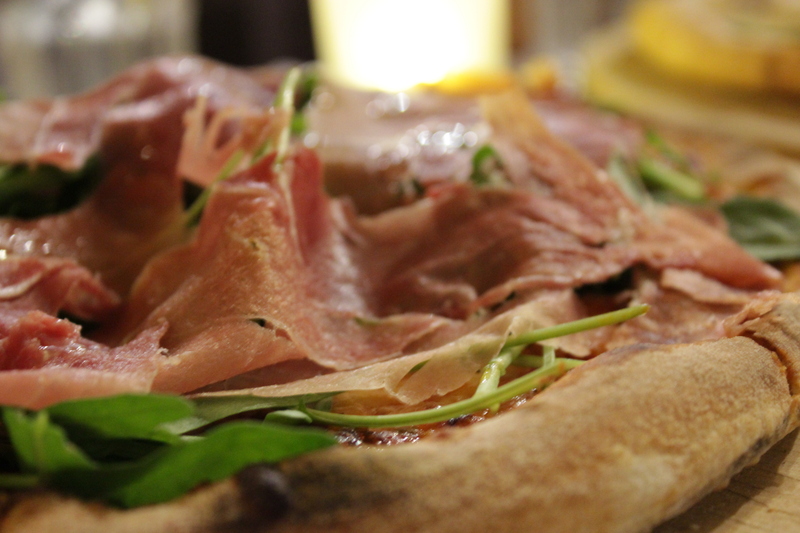 This pizza had the usual tomato and cheesy base with generous toppings of parma ham and rocket leaves. The parma ham was too salty for me and the rocket leaves too bitter! My friends on the other hand loved it especially the birthday girl who likes all things salty ( I on the other hand like things sweet). 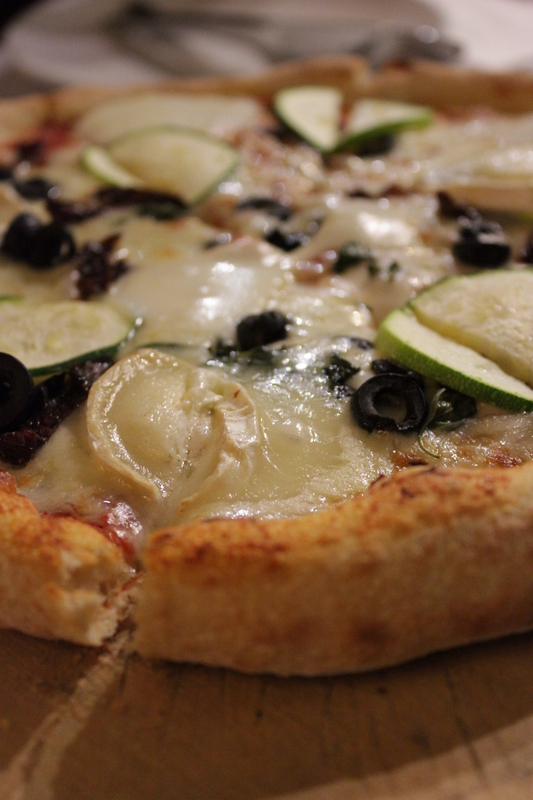 The other order had goat cheese, zuchinni and olives as toppings all baked together. I loved this one much more than the other because of the creamy goat cheese that was not overpoweringly salty. But part of me wished that they were more liberal with the zuchinni slices. The woodfired pizzas here are truly excellent! They are not excessively thin or thick like pizza hut’s. We finished every single bit of the pizza including the crust because the entire thing was so darn good. Best of all, ricotti does not scrimp on the ingredients at all just because the pizza is on offer. One of the friends was so impressed that she remarked she would never look at pizzas the same way again. Even though we were all stuffed, we could not resist having a dessert to share. 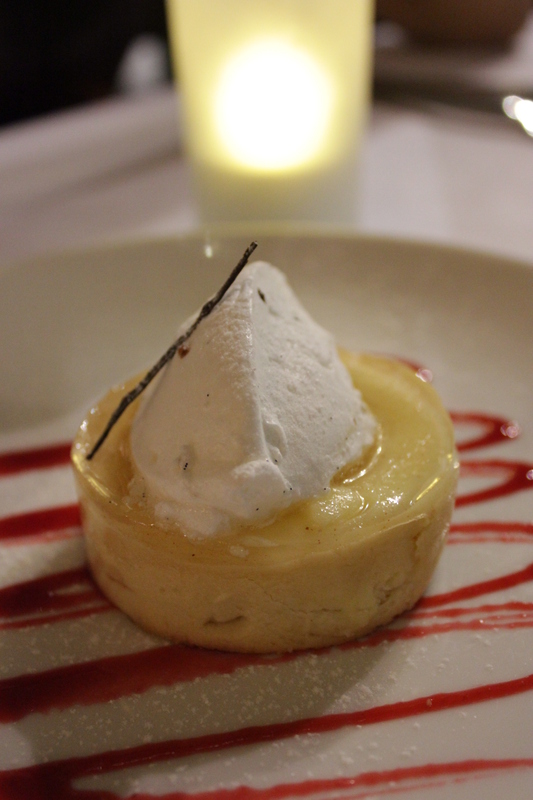 The lemon tart was a lovely ending to our meal. Encased in the thin tart casing was sour lemon curd with lemon gelee covering the top. The white stuff you see is not disgusting whipped cream but lemon infused meringue. Though it tasted a little jelly-like ( I think they added too much gelatin), I still appreciated it as it went well with the lemon curd. Pizzas are best shared in a large group so it’s a great place for large group gatherings. I highly recommend that you make a reservation for alfresco dining so that you do not disturb the other diners. They have many fans installed so heat is really not an issue.